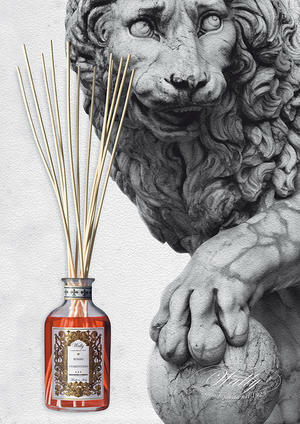 An exclusive reed diffuser from Wally 1925, parfume for home - Tuscan scent Rosso Fiorentino. Natural, essential oil fragrance with passionate and embracing tones, 500 ml glass bottle + reeds. The scent's durability lasts for about 6 months. The reeds are inserted into the bottle and the scent is easily regulated with these. A good alternative to roomspray and scented candles. Keep out of reach for small children.